PALMDALE –South Antelope Valley Emergency Services (SAVES) is hosting a Friendship Drive now through Feb. 11 to collect new socks and hygiene items for distribution to local homeless individuals and families as part of the Palmdale’s Season of Service. Items such as socks, shampoo, toothpaste, toothbrushes, combs, wash clothes, body wash and deodorant may be dropped off at SAVES, located at 1002 East Avenue Q-9 in Palmdale. 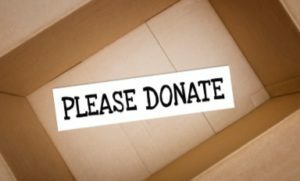 Items may be dropped off Monday through Thursday, between 9 a.m. and 6 p.m. Donation pick up may be available for large group donations. For details, call 661-267-5191. Volunteers are needed to assemble the donated items into hygiene kits at SAVES on Wednesday, Feb. 13, from 3 to 5 p.m. The hygiene kits will be distributed Thursday, Feb. 14, during the Antelope Valley Homeless Connect Day, a collaboration between Los Angeles County service providers and non-profit agencies that will provide free services to homeless people in need of assistance. For more information, call SAVES at 661/267-5191.